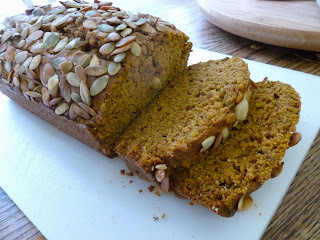 I have experimented with a lot of pumpkin bread recipes in my day; this one is my favorite. In my humble opinion, it is just as tasty as the pumpkin bread sold by that mega-chain coffee house, and it costs just a fraction to make! Preheat oven to 350 degrees. Spray a 9X5 inch pan with cooking spray. Combine dry ingredients and wet ingredients in separate bowls, then pour the liquid ingredients into the dry ingredients and stir until smooth. Do not over mix. Pour into prepared loaf pan and sprinkle pumpkin over the top. Bake for 50 – 60 minutes or until tests done. Cool in pan for approximately 10 minutes before turning out onto cooling rack. Slice when completely cool. You might want to make a double batch; this has a tendency to disappear quickly!